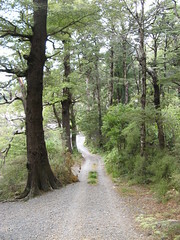 This weekend, Stacey and I joined a short (easy-rated) WTMC weekend walk to Paua Hut and back. Many people on the trip had a higher than average interest in juggling, which meant that this trip doubled as a juggling trip, whatever that amounts to. Huts visited: Paua Hut (1 night). People: Bronwyn, Stacey, Sally, Danielle, Danniel, Chris, Andy, Harry, Geraldine, Gail, Deborah, and me. I think the basic plan was to walk for a few hours towards Paua Hut, learn to juggle, and walk back again. 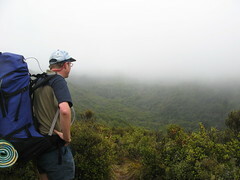 We began from Catchpool Valley, with an idea of making the walk slightly more interesting by going over Cattle Ridge via Browns’ Track (from the Orongorongo Track side). None of us had actually been up the north-western side of Browns’ Track before. In addition, DOC no longer promotes it as an officially maintained route, so we weren’t quite sure what to watch out for. On the Wellington topo map, it appears as if Browns’ Track leaves the Orongorongo Track just prior to crossing a bridge. We kept a careful eye open, and I even tried watching my altimeter toy to improve the chances of getting the right place, but unfortunately we didn’t actually find it on that morning. Instead, we ended up following around the marginally longer way, almost reaching the Orongorongo River before coming across the end of another track that was signposted as leading to Cattle Ridge. Nobody in the group had actually been to the Rimutakas for a while, and at the time we thought it might have been the Browns’ Track we were looking for, even though we weren’t expecting it to stand out anywhere near this much. At the very least, it was going in the right direction. After a short distance though, I began thinking that it looked very familiar from the last time I had visited the area , and before long we figured out we’d actually walked further than earlier thought, and had ended up on the Cattle Ridge Track. Basically, we were doubling back up the ridge from one end, above where we’d just walked, and heading back towards the cross-over intersection of Cattle Ridge Track and Browns’ Track. Once we realised this, it made it very easy to decide to simply watch out for the intersection, marked by a thumpingly obvious DOC pole in the ground, and then head down the south-eastern side of Browns’ Track to the Orongorongo River. Browns’ Track is steep, on both sides of the ridge, but the only place it really gets a little dodgy is a short space on the south-eastern side where it gets quite narrow. The drop off the side doesn’t really offer anything to land on if anyone makes a mistake. As far as I’m aware nobody’s actually fallen down and hurt (or killed) themselves, but I also haven’t asked around much. We all managed to get through it okay on this occasion. 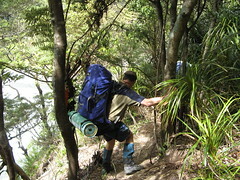 We reached Paua Hut at about 1.15pm, which was a convenient time for lunch. It wasn’t too obvious exactly what was happening with the weather, although the forecast had suggested that once the rain started, it’d persist for at least a couple of days. Most of us decided to go for a short walk for a look along the four-wheel drive track, to the south, during which we were only almost bowled over by one vehicle. Meanwhile, Bronwyn and Stacey stayed behind with the intent of making some juggling balls, using a combination of balloons and our emergency rice. It turned out that getting the rice to go into the balloons had been more complicated than first thought, and they didn’t quite have a set of three completed by the time we returned. Craig also chose to stay behind, and spent most of his time trying to chop up extra firewood. He was still at it for some time after we arrived back at the hut, and eventually had a go at sharpening the axe. Apparently, during the time we were away, a couple of kids had snuck around the back of the hut without realising that Bronwyn and Stacey were inside, and pulled a large tarp out of one of the storage bins. They had set themselves up at the campsite next to the river down below, using the tarp as shelter from the wind and rain coming from the north. In the end we didn’t bother them about it, on the assumption that they would put it back once they were done. Gail, John and Harry all turned up separately in the late afternoon, having come in separately with the intention of meeting us. There was some juggling time spent outside later in the evening, and Bronwyn even got up and showed us some of her circus tricks. Being the Saturday night before Guy Fawkes, which is the traditional New Zealand excuse to blow stuff up based on historical events that people no longer understand or care about, there were also some occasional fireworks going off near the river on Saturday night. Everyone returned to the hut (or tents) at their own rate, and I think we were all back by about 10.30pm or so. It rained all night. I woke up about 7am, and I was the first out of bed and eating breakfast, although followed shortly after by Stacey. The rain had mostly stopped by this time. Wandering down to the river showed that it was flowing faster than it had been on Saturday, but that it hadn’t risen a lot. A couple of hours later it still hadn’t risen, but the water was clearly dirtier than it would usually have been. This made it a slightly more interesting walk out along the river, as we made our way back towards the intersection with the Orongorongo Track. Bronwyn, Chris and myself, meanwhile, had decided that rather than walk back on flat route with the rest, we’d be quite keen to walk down the north-western side of Browns Track from the other end, at the top of Cattle Ridge, so we could discover where it came out. Having made arrangements to meet everyone back at the van, the three of us continued back up the same part of the Cattle Ridge track that we’d walked along the day before. Rather than turn left down the south-eastern side back to the hut, however, we instead took the narrower track on the right, leading down the other side. At first we weren’t 100% sure that we were in the right place, so I stood back with a compass to help verify that we were following the expected bearing, but we soon confirmed that we were on the right route. I’m really glad we did this, because it was an interesting little track to follow. It was slightly overgrown with gorse, but not by a lot. It was also a little slippery in places, but also not by a lot. Furthermore, there were several points along the way which opened up into some revealing views of the nearby ridges, albeit having them slightly faded by low cloud. We arrived back at the Orongorongo track at about 11am, perhaps 45 minutes after we’d deviated from the main route that the others were following. Considering we had been moving quite quickly with just the three of us, we had no idea whether we were in front of or behind them. From here it was just a race to the end of the road, probably for another 45 minutes or so. When we arrived, we found that the others had been there for about 5 minutes, so it was very good timing. This weekend turned out to be a nice relaxing walk, and I got quite a few ideas of other places I’d like to go to in the Rimutakas in the future. For one thing, I’m now keen to ask around about whether it’s feasible to to a loop up the ridge from the southern side of it, maybe starting from Paua Hut and following Paua Ridge up to Tapokopoko and then running around the ridges somehow back down to Mukamuka Stream, and up the southern side of Mount McKerrow. This looks possible on the map, at least.